Eager kids, proud parents and science fans filled the Fieldhouse at Ottawa’s Carleton University Wednesday to explore the projects created by some of Canada’s top young scientists as part of the annual Canada-Wide Science Fair. 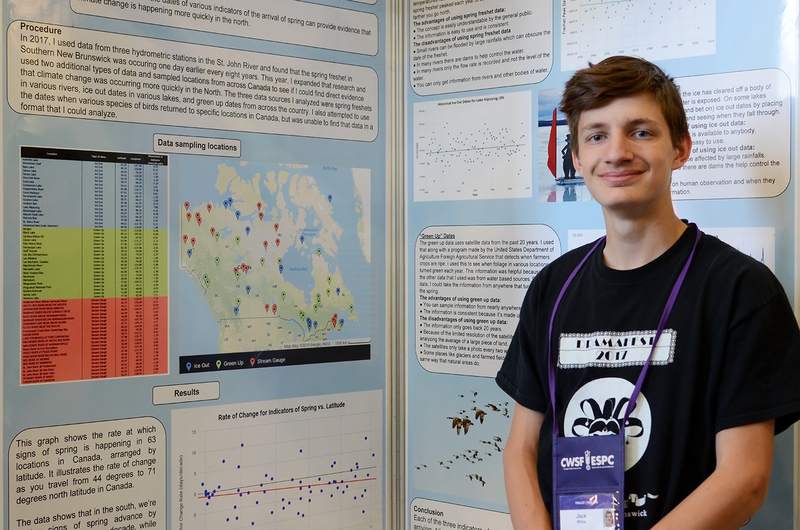 Organized by the non-profit organization Youth Science Canada, the Canada-Wide Science Fair is a national competition that immerses youth 12 to 18 years old in all things science, technology, engineering and mathematics. This week, 450 regional and provincial finalists gathered in the nation’s capital to present some 400 projects on topics related to information technology, health, energy, the environment and more. Projects are judged by experts in each field, and the students compete for prizes and scholarships totalling nearly $1 million. The goal of the competition is to inspire young people to engage with pressing issues happening in the world around them. Dominic Tremblay, a representative of Youth Science Canada, says the event is important because it gives students the opportunity to get invested in the sciences early on. Many of the participants find inspiration for their projects right at their doorstep, and look for solutions to problems that affect their communities. 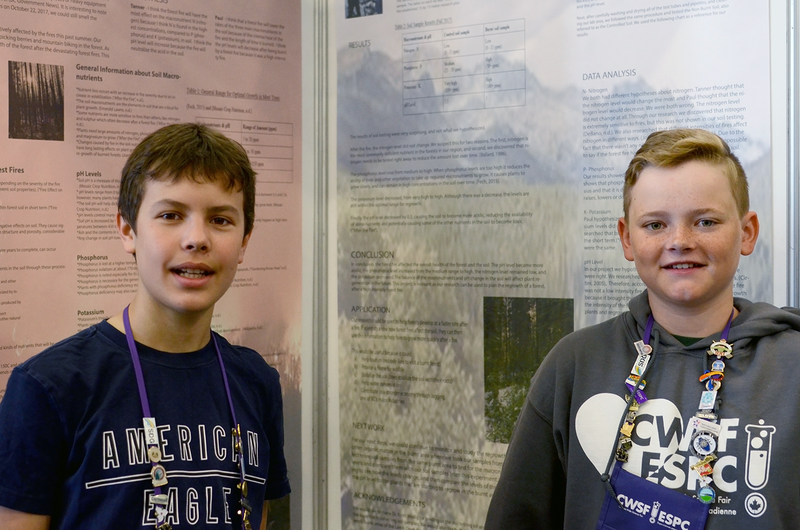 After witnessing firsthand their province’s worst fire season on record last summer, Tanner Eckersley, 13, and Paul Alexander Chong, 14, classmates at Parkland Junior Secondary School in Cranbrook, B.C., decided to work on a project examining the impact of the fires on the soil and plants of the affected forests. “You see it on TV, but you don’t realize how bad it truly is until you witness it in person,” says Eckersley. “The first time I entered the burnt forest it was really crazy. It was completely black. You could still smell the smoke,” adds Chong. The duo collected soil samples from a burnt forest, as well as four samples from an intact forest. They then tested the samples for macronutrients—nitrogen, potassium and phosphorus—and pH level. They found high-intensity fires like those that occurred in parts of B.C. in 2017 have a negative impact on soil quality, and suggested finding natural ways to return nutrients to the soil to enhance the growth rate of affected plants—a project they might work on next year, says Chong. White examined annual records of freshet peak, ice out and green up for 63 locations in Canada dating back 20 to 118 years depending on the availability of data and found that on average, spring arrives a day early every eight years in southern Canada and three days earlier every 10 years in the North. Ultimately, White wanted to create a project that would make climate change more digestible for the public. “I wanted to show people ways of monitoring climate change that they could understand, so I used things that people could relate to,” he says. 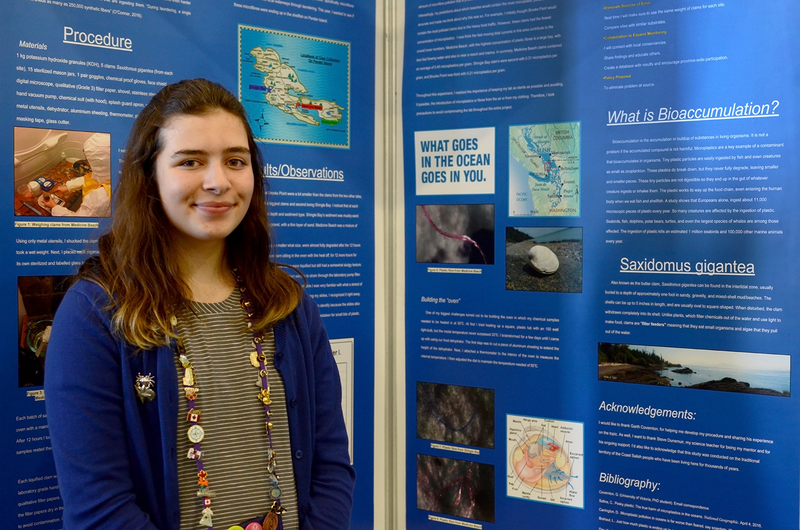 Lauren Grace Ohnona, 13, took to the beaches of Pender Island, B.C., where she lives, to determine the degree to which shellfish are being affected by microplastics — tiny pieces of plastic from a variety of domestic and industrial sources that make their way into rivers and oceans. To do so, she canvassed three beaches on the island and collected clams. Ohnona then used potassium hydroxide to melt down the clams and create microscopic samples for analysis. Through her research, she discovered that for every gram of clam, half was microplastic. And one of the beaches she examined turned up 98 pieces of individual plastics across five clams—all fibers from fleece and synthetic clothing. As a solution, Ohnona suggests that people should wash their synthetic clothing less often or, better yet, wear clothing made out of natural fibers such as cotton or wool. 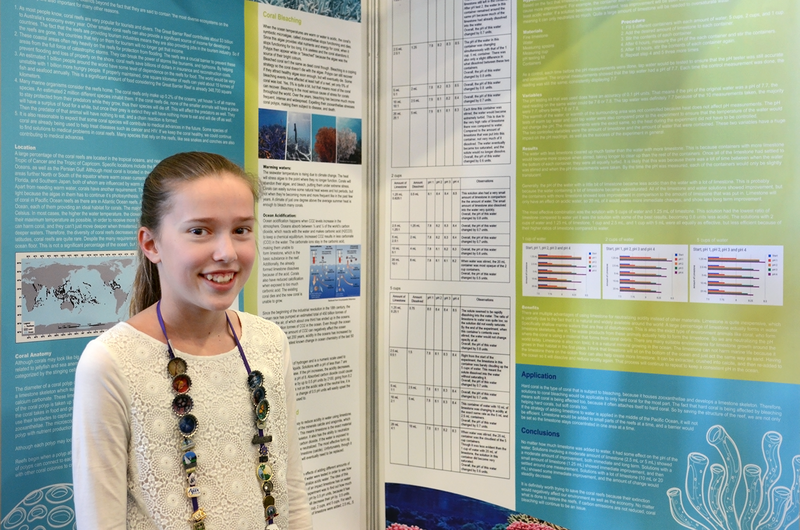 As someone who enjoys snorkeling, Nikki van Schaik, 13, wanted to find out more about the causes and effects of coral bleaching. Coral bleaching occurs in tropical and subtropical oceans due to warmer-than-normal water temperatures and acidification. Unusually warm temperatures cause the corals to expel zooxanthellae, symbiotic algae that normally live within their tissues and give them their distinctive colours. Acidification also causes corals to bleach and become brittle as they are unable to absorb the calcium carbonate needed to build their skeletons. Van Schaik decided to test whether there are ways to reduce the acidity of ocean water using limestone—an agent with the ability to neutralize acids. She added various amounts of limestone to water, and found limestone had a beneficial impact on the level of acidity. Nature: who knows, who cares? Growing up in small-town B.C. with parents who are both biologists, 12-year-old Chloe Williston spends a lot of time outdoors. She wanted to find out if concern for the environment as an adult could stem from learning about nature as a child. 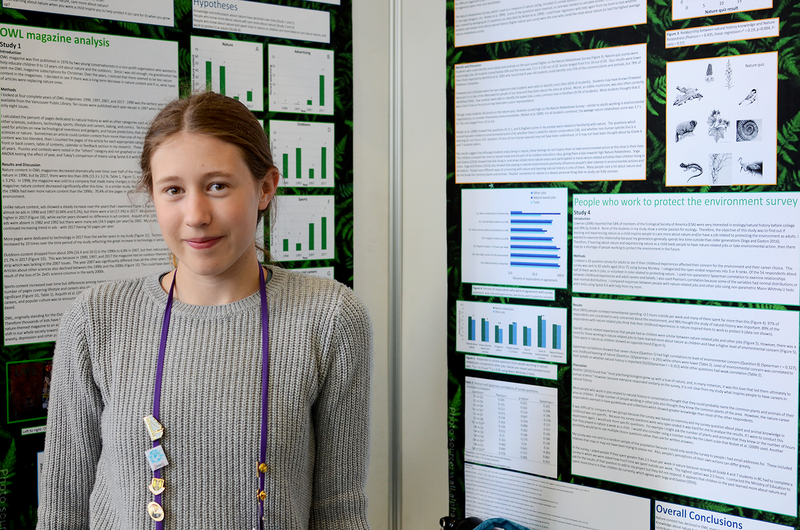 By examining content from OWL Magazine and past projects from the Canada-Wide Science Fair, she first determined that nature content in both is decreasing. But she also discovered that learning about the environment early on can spark a desire to care for it. In fact, her research shows that more than 85 per cent of those now working to protect the natural environment were inspired to do so by learning about nature as kids. The Canada-Wide Science Fair is open to the public until May 18 at Carleton University in Ottawa.